Which of his famous films featured Gary Cooper as a tuba-playing poet? MR. DEEDS GOES TO TOWN (1936). The answer to this question could be found on page 2 of the Gary Cooper section at Reel Classics. 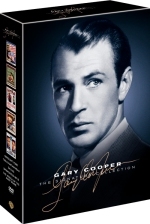 A 6-DVD boxed set of THE GARY COOPER SIGNATURE COLLECTION courtesy Warner Bros. Home Video.